Including my case, when we feel pain, there are many cases to be diagnosed that pain come from pressure for nerve due to spinal disc herniation, spinal canal stenosis, spondylolisthesis and so on (*). (*) Including so called skeletal system disease such as sciatica, disc syndrome, spondylolysis, osteoarthritis (OA), spondylosis deformans, piriformis muscle syndrome, tendovaginitis, meniscus problem and so on. But same as me, there is possibility that these diagnoses are different from fact. Reason is following. Never feel pain by pressure to nerve!? Fundamental of these diseases is, pressure to nerve makes misunderstanding on brain that destination of nerve has pain. But mechanism of feeling pain was already clarified from physiology point of view. At lease, even when nerve received pressure, it never makes pain and pins-and-needles sensation on any portion of body, even if heavy pressure to nerve may make palsy/insensibility. Understanding on current western medicine is that these illnesses make pain from nerve as exception. Including my case, if pain comes from pressure to nerve, I must have many questions. Why recovery rate by operation is low, even pressure was removed. There are many simple questions. 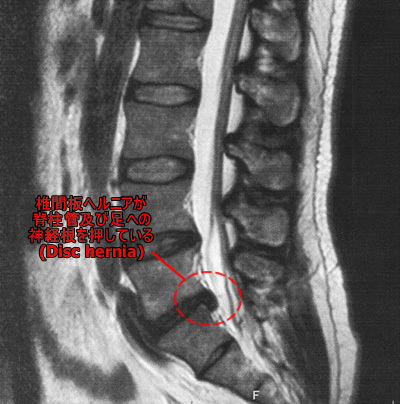 If now you are diagnosed as disc hernia, spinal canal stenosis, spondylolisthesis and so on, please forget basic assumption and consider mechanism and your symptom. At least in my case, there were many questions. Of course, there are many cases that operation removes pain. You may think if real cause is muscle spasm, operation doesn’t make sense. However there is possibility anesthesia for operation stops muscle spasm. When this logic is collect, definitively operation doesn’t make sense. In fact, there are cases that when disc hernia cannot be found after open back for operation then close back, pain was disappeared. When we consider this situation, it’s more reasonable to think both pressure and pain are not related. What I described in above section is about “Pain” and “pins-and-needles sensation”, not “palsy/insensibility”. When there is “palsy/insensibility”, that may not be muscle spasm. Please don’t mix both symptoms.